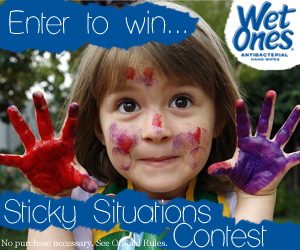 Wet Ones and Mom Central are running a Facebook contest asking moms for their best tips for getting out of a sticky situation. As a mom of three who are a whopping 21 months apart, we have seen more than our fair share of sticky situations. There was the time I took my kids to the park for a nacho picnic. We had cinnamon twists for dessert and I didn't bother to clean up their faces between lunch and dessert since I didn't see the point. I know why I should have cleaned them up now! Did you know that nacho cheese sauce acts like glue once it's dried on a face? And that cinnamon and sugar smeared into the cheese sauce acts like sand paper when you try to clean it up? Lesson learned, I'll never do that again! Tip #1 Clean your kids' faces before they eat something covered in sugar! Tip #2 - Never keep your potty training bribes in the bathroom! EVER! Now that you've seen the pictures I'll set the stage. I was doing the dishes while the kids were playing in my oldest daughter's room. Now you know the moment where you realize your kids are up to no good. The hairs on the back of your neck are tingling and you have the "oh no" thought. I went down the hallway and heard the water running in the bathroom. I open the door and find Isabella handing out candy corn. Fantastic! I turned off the water and sent Isabella into timeout. I had to change Mark and Molly since their clothes were destroyed. I pulled Isabella out of timeout and tried to explain why she shouldn't have gotten the candy corn down. And what did she say? So now you know some of my sticky moments with my kids and I know that if you're a mom you have been in many sticky moments yourself. Head on over to Facebook and enter the contest! I entered and it only takes a few minutes to enter! You could win a brand new iPad mini and 3 sets of prize packs with tickets for 4 people to go to Six Flags. What about the option where you just let the stuff on their face wait it out all afternoon until it turns crusty and flakes off by itself? That's been my MO for a while now.